Up until the seventeenth century the Mediterranean was the centre of commercial power. Because of this, the great sea was jealously guarded and was feared by English sailors. At the eastern end was the rich Levant and to import goods from there England had to rely on other nations with their attendant mark ups. To break this stranglehold became of economic, political and maritime importance and in 1550 one ship made a successful journey. This was the Aucher, whose owner was Sir Anthony Aucher (d.1558). Anthony Aucher was the only surviving son and heir of James Aucher (d.1509), of Otterden, Kent, and his wife, Alice Hill. On the death of her husband, Alice married into the family of Hardres of Upper Hardres, near Canterbury and as a young man, Aucher worked in the household of Thomas Cromwell (c1485–1540), Secretary of State to Henry VIII (1509-1547). There he became a proficient accountant and acquired the position of auditor and surveyor of the estates of Christ Church Priory, Canterbury. In 1537, Aucher was appointed paymaster of the Royal Haven works at Dover, his base was at Archcliffe Fort. Up until the end of the 15th century Dover’s harbour was on the east side of the bay but had albut silted up. Around 1495, John Clarke, Master of the Maison Dieu sought Henry VII’s patronage to turn a small natural cove at Archcliffe Point, at the west side of the bay into a commodious harbour. This he did by building a strong bank out into the bay, and ‘cut an entrance through Archcliffe Point’. At the extreme end of the bank, he built two towers on which mooring rings were fixed. Due to repeated severe southwesterly gales, in 1530, one of the two harbour towers was demolished and part of the bank was washed away. John Thompson, minister of St James’ Church wrote to Henry VIII, on behalf of four Jurats, with a plan to improve the harbour. Henry responded favourably with £300 and as a reward he was knighted and given the position of Master of the Maison Dieu. Sir John was also appointed engineer and work began on St Anne’s Day, 26 July 1533. The King took an active interest in the project and brought in his own harbour master, John Young, to construct a breakwater, some 1400 feet long and 18 feet high, using blocks of chalk and stone, with a Mole at the sea end. John Young, after experimenting with floating nutshells and eggshells calculated that stone piles could be floated out in casks and then sunk in situ. Henry was so impressed by the success of the scheme that Young was granted a pension of 4d per day for life. A Mole was built first then a wall was constructed from the land to meet it. However, costs escalated and when they reached about £80,000, on Aucher’s advice, Henry withdrew his support. This left the Mole isolated and was to be a hazard to shipping until after the Ville de Liege catastrophe of 1929. Besides keeping a weather eye on the escalating costs of the harbour works, Aucher had other projects to handle. Then Henry VIII chose to align himself with Emperor Charles V of the Holy Roman Empire (1519-1556) that culminated in the Anglo-French War of 1542-1546. 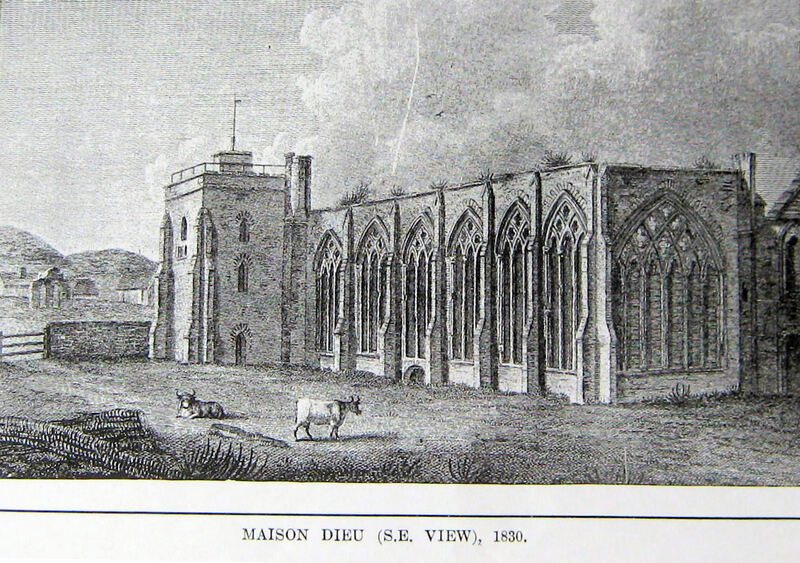 Aucher was appointed paymaster and surveyor of all building works in Dover and was responsible for turning the Maison Dieu into a major victualling station for the army and navy. In 1544, English forces took Boulogne and held the town preventing a French invasion in 1545, however, as Aucher undoubtedly showed, the war and the capture of Boulogne cost the English £2million. 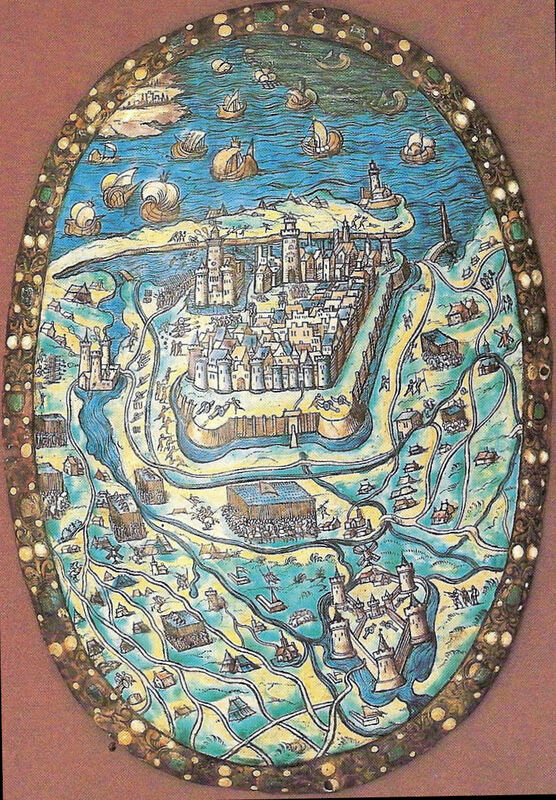 The French retook the town in the subsequent War of 1549-1550. During the Dissolution of Monasteries between 1536 and 1541, Aucher’s accounting acumen was well used and in 1543, he was appointed a Commissioner of Kent. 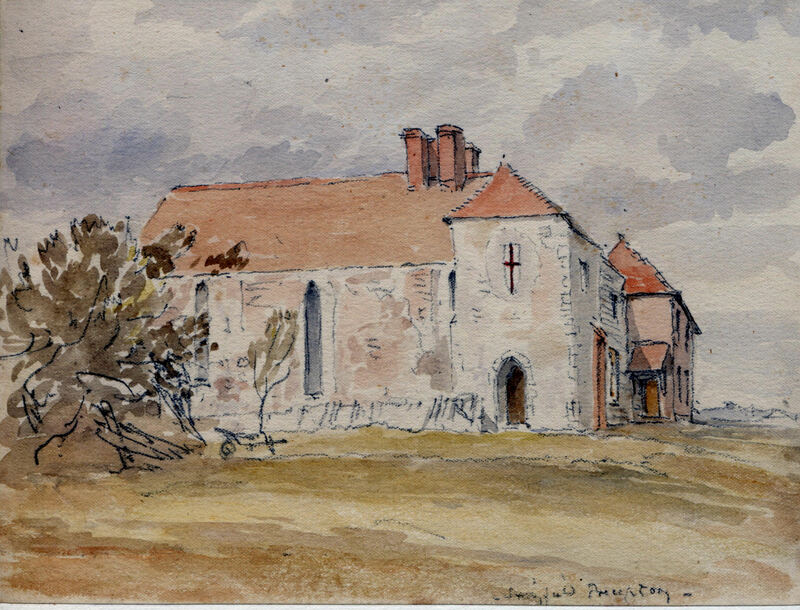 The position enabled him to amass a great deal of property including the Swingfield Preceptory and Tilmanstone Rectory along with a small fortune. His accounting knowledge and wealth made Aucher an ideal appointee for the position of Master of the Jewel House a post he held until his death. He was also given a number of other appointments and on 22 February 1547 was knighted by Edward VI (1547-1553). Albeit, questions were beginning to be asked regarding Aucher’s fortune but little official notice was taken of these concerns. Like many subsequent self-made men, Sir Anthony Aucher decided to build the equivalent of a modern luxury yacht. 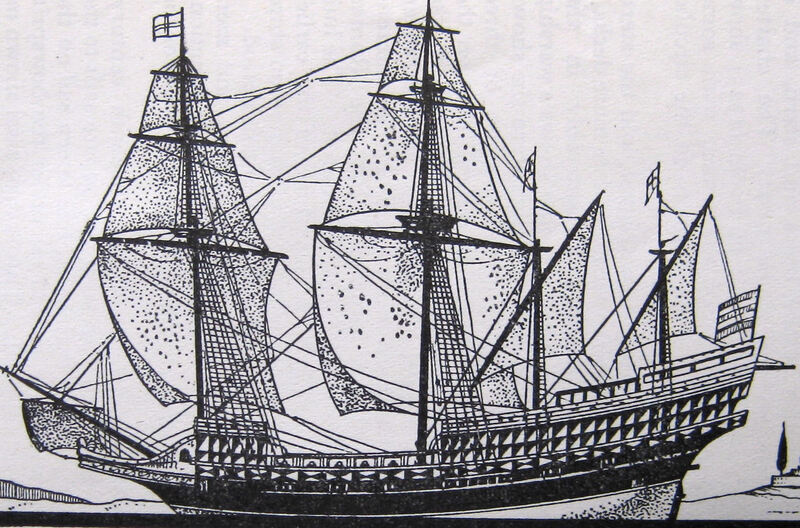 This was the great bark Aucher, a vessel of 240 tons with a crew of 200 and was launched in 1545. Sir Anthony leased his ship to the Navy as the flagship of Thomas Wyndham (1508- 1554) in the Scottish campaign of 1547–8 but he knew that it was a cargo of scarce goods from the Levant where real money could be made. On 13 November 1550, the Aucher set sail from Gravesend, under Captain Roger Bodenham. The crew of seventy men and boys were chosen with the help of the famous explorer, Sebastian Cabot (c.1474–c.1557). The remit for the voyage, and no doubt much of the government funding for the journey, was to provide experience in long distance seamanship. This was a skill that English mariners lacked at that time. Because of bad weather, the Aucher did not arrive in Dover until 6 January 1551 and it was here that Sir Anthony joined her. On leaving Dover, they made for Cadiz, southern Spain, arriving on 30 January. There they stayed for three weeks, before making sail and calling at Majorca and Sardinia arriving at Massina in Sicily on 5 March. 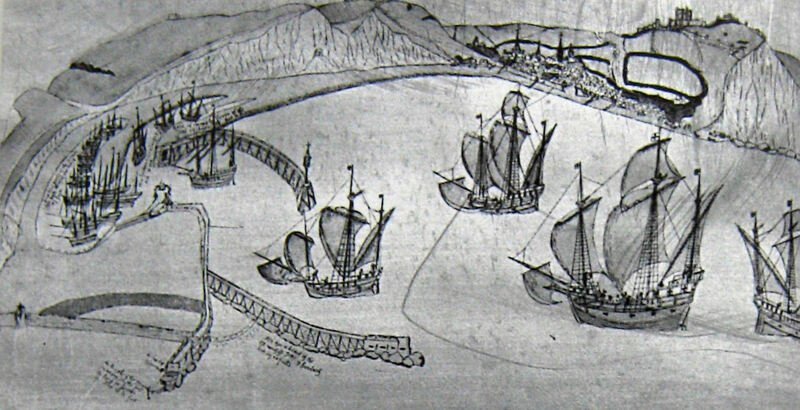 Then it was onto Chios in the Levant, where they were given safe anchor for 20 days for the sum of 12,000 ducats. However, once in the harbour, locals swarmed on board carrying off everything that was not nailed down! Due to Aucher’s size and unfavourable winds, they could not escape and some of the crew threatened mutiny. In response, Sir Anthony’s servant loudly proclaimed, while brandishing a sword, he would take on ‘a whole army of Turkes and never yield.‘ This brought the dissident crew into line but not the locals. That night a few of the crew went into the town pretending to merry make. While they distracted the locals and with the help crews off other ships, the Aucher managed to creep out of the harbour. The merrymakers were to join the Aucher at sea but were caught and, it was assumed, sent as slaves to the Turkish galleys. Luckily, for the crew, the prisoners were hospitable even hiding the beleaguered Aucher and the crew when their foes ships were off the island. In fact, the prisoners were so friendly that before leaving, the Aucher was loaded with wine and other goods. Sir Anthony and the crew of the Aucher were to have a number of other adventures before finally returning home to England. By that time the rich cargo was still intact and the crew well trained. Of the crew, it was later claimed by Captain Bodenham that all became ships’ masters within the five years following the Aucher’s return. One member of the crew, apprentice pilot Richard Chancellor (d 1556), laid the foundations of English trade with Russia. 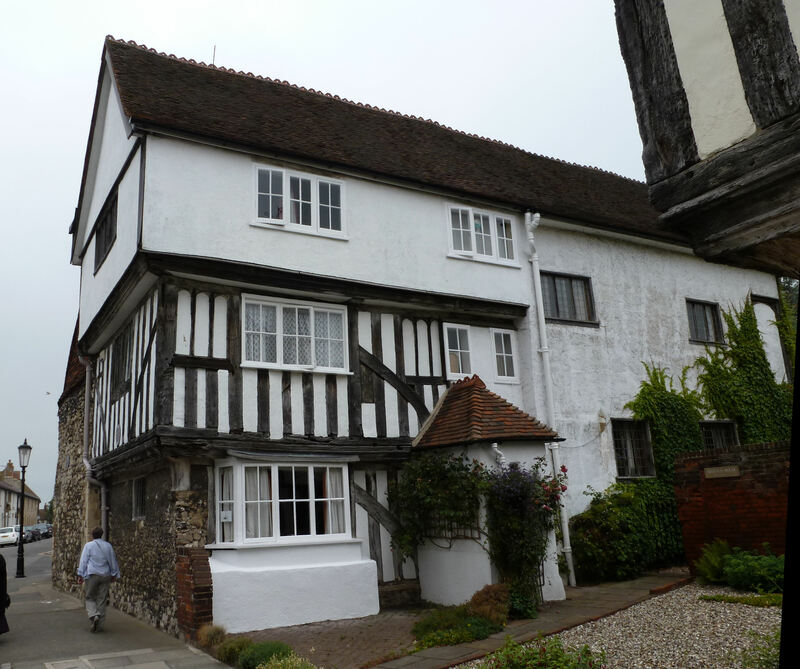 Thomas Arden’s house, Faversham where he was murdered on 15 February 1551. While Sir Anthony had been away, England had experienced bad harvests and the people were in revolt. With the expertise in handling a ship’s crew, Sir Anthony was assigned to put down the insurrection in Kent over which he was notoriously aggressive. Then a major scandal touched the Aucher household. on 15 February 1551 Thomas Arderne, a former mayor of Faversham (1548), Comptroller of the Port of Sandwich and Customer of Faversham, was murdered. His wife, Alice and her lover, Thomas Mosby, were responsible, the couple having made a number of attempts before. These included hiring John Greene, one of Sir Anthony’s servants, to do the dirty deed. Like all the other potential assassins, John Greene botched the job. Eventually two hired did assassins succeed but were caught and dealt with. Both Alice and her lover were arrested and found guilty and all the other potential assassins were rounded up and found guilty of complicity. Sir Anthony’s servant, John Green, was hung along with Alice’s lover Thomas Mosby and other attempted assassins. Alice was burnt at the stake in Canterbury. Sir Anthony’s connection with the case put him in the spotlight and this was the start of his downfall. He was asked to account for many of his transactions on behalf of the Crown and was forced to pay back some £4,500. When Mary I (1553-1558) came to the throne tighter accounting controls was implemented and Sir Aucher’s creativity in that field came in for scrutiny. He was forced to sell or mortgage a number of his estates including Swingfield. Then, in 1556, his accounts as Keeper of the Jewel House were audited. It would appear that the findings were so embarrassing that instead of paying a hefty fine, imprisonment or even execution, Sir Anthony was obliged to resign the office and given a gratuity of £366 13shilling 4pence! Further, Sir Anthony was appointed Marshall of Calais and Governor of Guisnes. England had ruled Calais since 1347 but Mary and her husband Philip of Spain (1554-1558) sided with Spain when that country invaded France. The defences in Calais consisted of the man-made fortifications that can still be seen. In January 1558, Henry II of France (1547-1559) forces made a surprise attack on the town and Sir Anthony was badly wounded. On 7 January 1558 Lord Thomas Wentworth handed the French the keys to the town and it is said that as Mary I was dying, later that year, she proclaimed that, ’When I am dead and cut open, they will find Calais inscribed on my heart.’ Sir Anthony Aucher died of his wounds on 9 January. Sir Anthony Aucher’s granddaughter Anne married the great maritime explorer, Sir Humphrey Gilbert (c.1539–1583). This entry was posted in Aucher Anthony - Entrepreneur and Creative Accountant, Maritime. Bookmark the permalink.